I hope you enjoyed your Memorial Day weekend, and remembered to give thanks for all of those brave men and women who have and continue to put their lives on the line in the name of freedom each and every day. 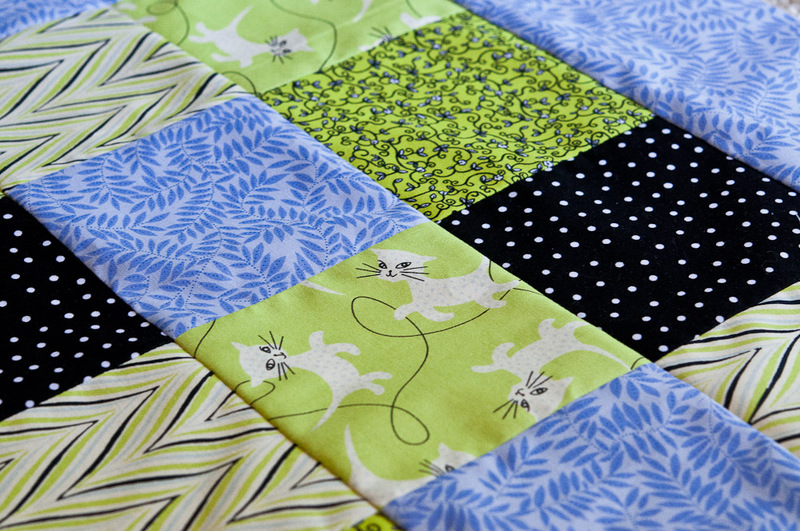 Leslie is working on this cat bed which she believes her cats will most likely ignore. HA! Stephanie is hand piecing these fabulous stars from Erin McMoriss's "Somersault" line. She does such lovely hand work! And last, but not least, Trina is working on this twin sized Zig-Zag Quilt for one of her kids. Lucky kid! LOVE the orange. A border is in the works. Finish Up Friday is here! Our Habitat Quilt is FINISHED! 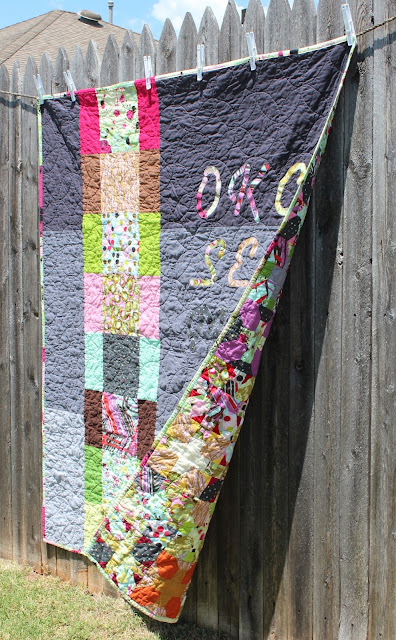 Habitat Quilt: I LOVE the eclectic charm of the quilt top and the strikingly beautiful and simple back. 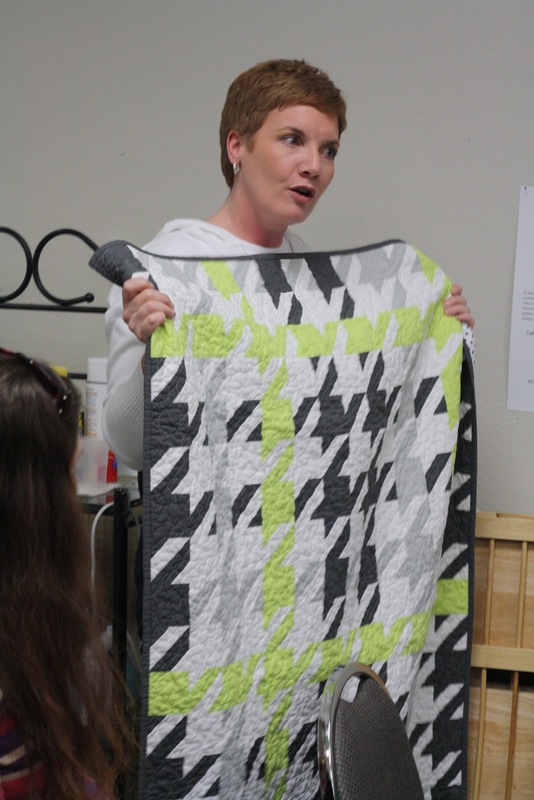 About: This is a Kona solid challenge quilt that the ladies and I from the OKC Modern Quilt Guild made. Basically 13 ladies all made a few blocks for the front using only solid fabric with the “habitat” fabric from a new line my Jay McCarroll. I suggested “X & +” blocks for the top. We (Erin, Angela, Stephanie, and Kristine) then pieced the top together in one day at my house. (Can you spot the blocks YOU made?) :) Later that day we pinned the quilt together to get it sandwiched and ready to quilt. I love how each block is unique and the solids everyone chose to use were different too. I then created the back for the quilt. My inspiration for the back was a “filmstrip” design with the habitat fabric and a few of the solids. So far so good. I thought the background fabric should be a Kona gray. But I noticed in my stash I didn't have enough of any of my kona grays. So, Stephanie and I decided to use three! We then needed to make the filmstrip wide enough to have the back be big enough for the quilt top due to my limited gray fabrics. So, I had the idea of adding a coordinating solid to either side of our habitat fabrics. The letters were appliqued from the 9 habitat fabrics onto the gray backing. It reads “OKC SEW MOD” standing for OKC, so and SEW are play on words, and MOD stands for Modern. The font we picked was the one everyone voted yes on. For the binding I picked the "drop cloth" fabric along the right side of the quilt. I looks really cool and different as it goes around the quilt edge. I free motion quilted it using the blocks on the quilt front as a grid. I quilted it in a “clementine” or “cathedral window” pattern with gray thread. I added a “filmstrip” flare to the binding in pink and green if you can spot it! Thanks ladies for coming together on this group project and making this a beautiful quilt! It's "Coffee Talk Tuesday" again, and it's actually happening on a Tuesday this time. YAY! 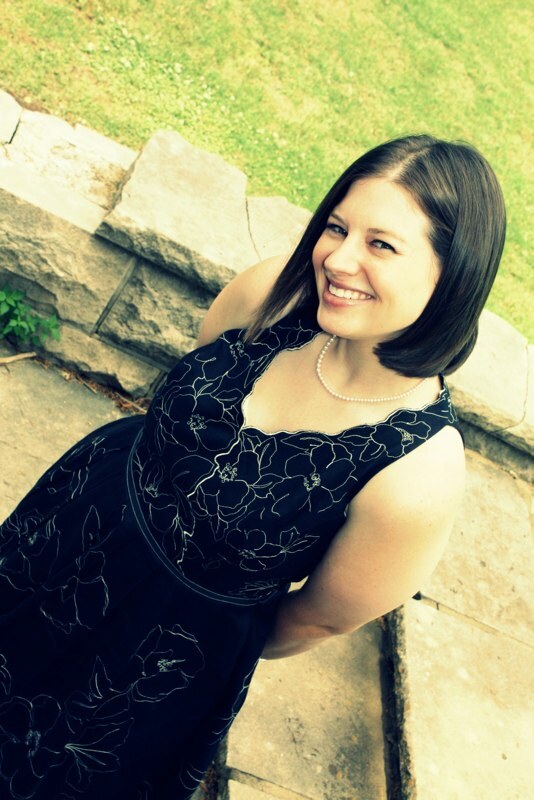 :) This week we'll get to know Kristine Palmer a bit. :) She's super sweet, a bit quiet at times, and uber talented. So, without further ado, here's Kristine! Kristine with a Cathedral Window pillow she completed for an OKCMQG scrap swap challenge. Hi, Kristine! Lets get the nitty gritty out of the way. Do you have a blog? Maybe a store/shop? Yes, it's called My House Full. Maybe this will push me to get more posts up. It's been severely neglected. No shop though. So, how long have you been sewing? I can't remember when I started sewing. Sometime between the ages of 9 and 12, I think. My mom taught me some, and I experimented some. When I was in high school, I created a marching band outfit for a troll doll as a present for a friend. I wish I had a picture - I wonder what I would think of it now. After I graduated high school, I didn't do much until I wanted to sew clothing for my kids. I still have that first outfit that I put together on my own. It has its flaws, but each of my boys were able to wear it, and it is still in great shape. In 2001 I got my first sewing machine. Then in 2004 I took a sewing class from a junior college that focused on understanding different stitches and on garments. I have learned a lot over the years. There are things that I was unaware of during high school, but now I understand the why and how. When did quilting enter the picture? 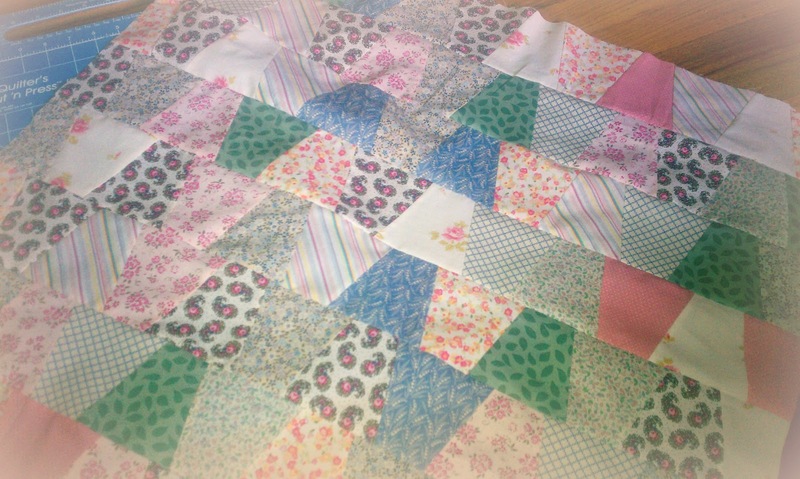 I have been quilting for about 10 years now. I started when my mom invited me to a block-of-the-month class at the local quilt shop. I had admired my moms work, and my grandmother's creative works always awed me. The store had an ingenious plan to drive traffic to their store. On the first Saturday of January, you pay a small kit fee for the first block. Then you return the next month with your completed block, and get the next kit free. I didn't finish it every month, but from 2002 to 2008, I attended that class. It was an amazing skill builder, and I learned many techniques and got many opportunities to practice and increase my skills. Sadly, I only have one of those quilts completed. The others are waiting for me in my UFO pile. This is one of Kristine's first quilts. This dinosaur quilt was quilted by hand. You'll have to finish it and bring it to a meeting!!! :) So, your mom and grandma were the main influence in your journey to the quilting world? Yes, my mom didn't have to push me hard to go to that first class. I already had a fascination with fabric and designs, even if I was more focused on clothing than quilts. It was a very natural transition, and once I started, I began to see the possibilities of all the different things I could create. That vision has only expanded since then. What draws you to modern quilting vs. a more traditional style? I can't say that I am a strictly modern quilting person. I love both. There are some very traditional patterns that I want to do, like a double wedding ring, but I also want to do some art quilts and modern designs. What I really enjoy is the freedom to bend the rules. I think so many of us are in a similar boat on that one! :) Do you have a particular person or style that influences you in your modern quilting ventures? Amanda Jean Nyberg of Crazy Mom Quilts. 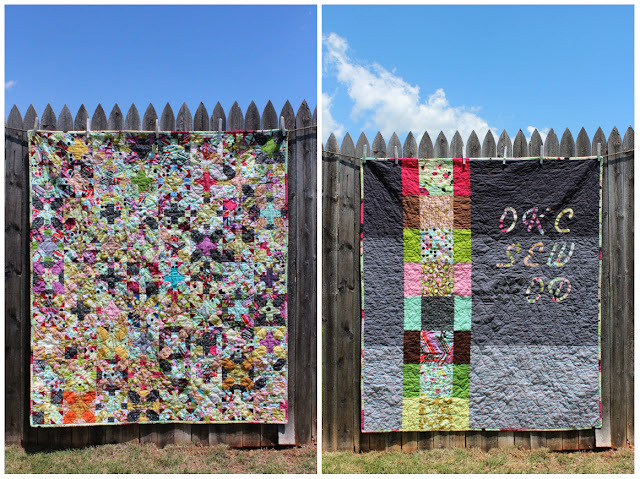 I find myself falling in love with each quilt she makes. I love her use of white in her quilts, and her color choices are always pleasing to my eye. And, I am a sucker for Batiks. Hoffman Batiks, especially. I love the way the colors seem alive. The shout, "Bring me home with you!" and it always hurts me when I have to say no. 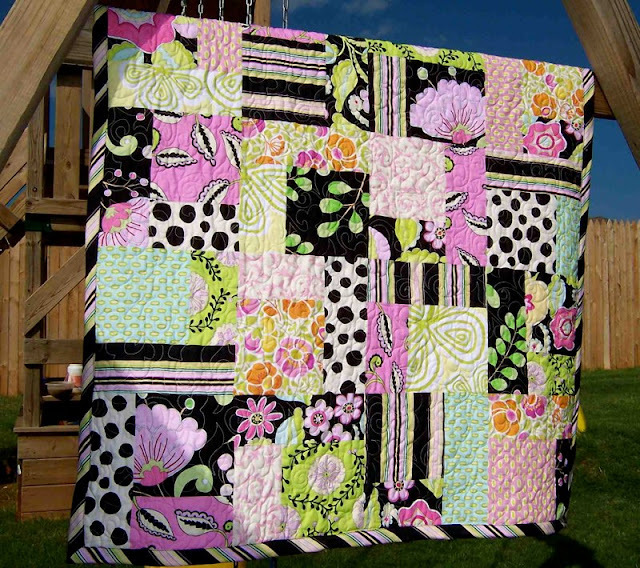 The batik block of the month was machine quilted. I stitched in the ditch with a walking foot. I changed how I tied off the thread halfway through - I really had no idea of what I was doing! But it has gone through a lot of abuse and still looks great. Is there a time when you find most of your productivity happens or when great ideas hit you? I struggle to find time to work on my quilts. My husband is back in school working on a PhD, and I am a stay-at-home mom to six kids. The past few years have not been very productive. But I have so many ideas of what I want to do that I don't know where to start. 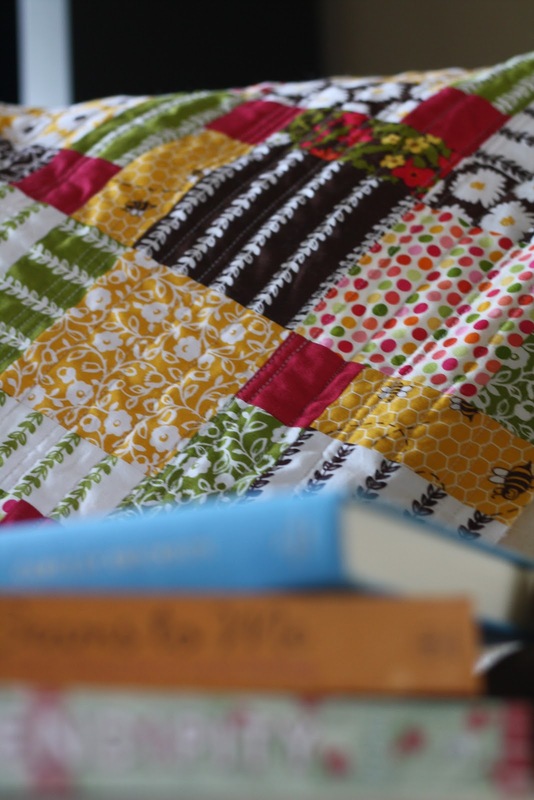 I get inspiration from quilt shows, blogs, fabric catalogs, and books. I think about how I would change it, the fabrics I would use, and how I would put it together. That's another interesting point. So many people of the modern quilting variety are mother's of children who are still living at home, making finding that time so much more of a challenge. But, since you have so many ideas swimming around in your head, what projects are you hoping to work on next? I kinda have a quilt "bucket list." The top one is a double wedding ring King sized quilt made of Batiks. Every time I see one, I can't help but think, "I want to make one!" I also want to make some sort of tumbling blocks quilt, hexagon, storm at sea, spider web sting, miniature, lone star, and something with butterflies and lots of pink and purple for my daughter. The next quilt I will work on will be for my oldest son. It has been in the works for a number of years. The design is based off of Lego Bionicles, one of his favorite toys since he was little. Your list sounds as lengthy as mine! :) Now, out of the quilts you've made, which one are you the most proud of? 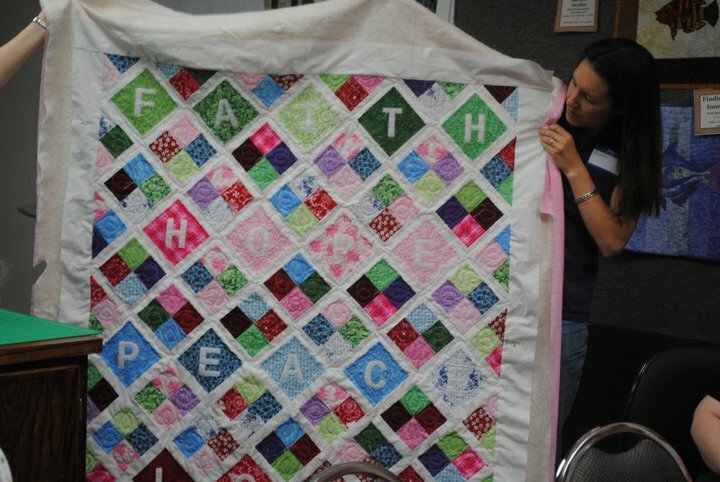 "Faith, Hope, Peace, Love" is the quilt that makes my heart soar every time I think of it. I made it soon after I found out a long-time friend was battling cancer, and the prognosis was unsure. Each part had a meaning. Green was for Faith. Pink was for Hope. Red was for Love. Blue was for Peace. The quilting in the sashing is actually scriptures for the bible, each focusing on one of the themes. The quilt was a surprise, and I'm happy to say that she loved it and used it. She is now in remission, and I'm so glad I took the time to make it. What a sweet story! I'm sure that quilt is treasured dearly. 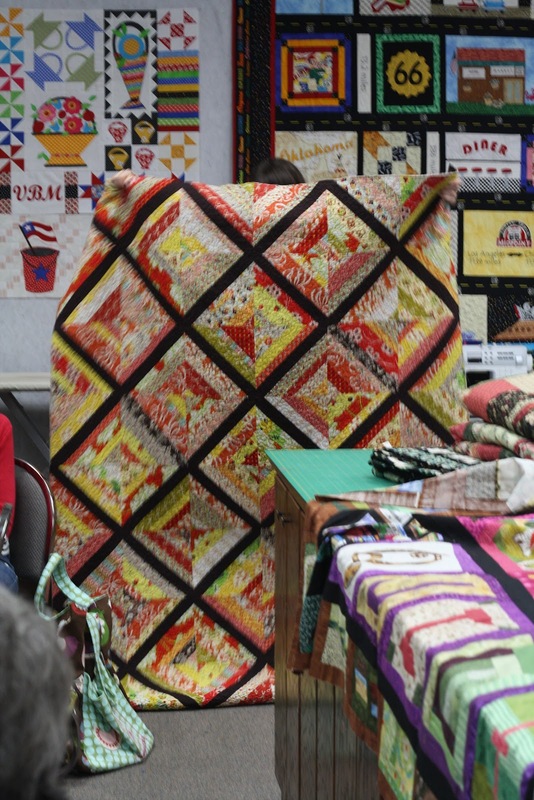 :) But, of course, now that we've discussed your greatest quilt...can you tell us about a project that went terribly wrong? Not other than taking much more time than what I had intended! I have a way of having big dreams, and underestimating the amount of work that will have to go into it. If you had to choose one must have book, or blog to visit, what would it be? I keep learning from Leah Day. Her tutorials on free motion quilting are amazing. A few years ago I thought I have to mark everything before I quilt it. Now I know that isn't the case at all, and the results can be much more spectacular. 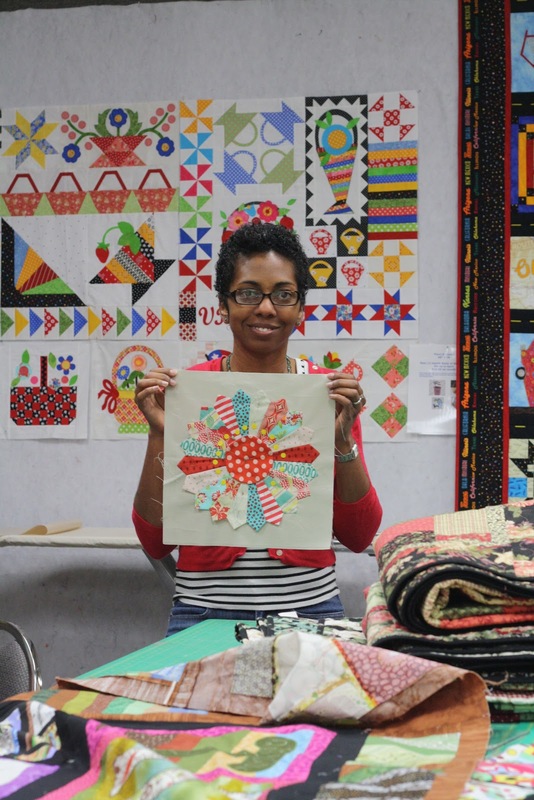 Her art quilts are amazing and push me to experiment with my own quilts. 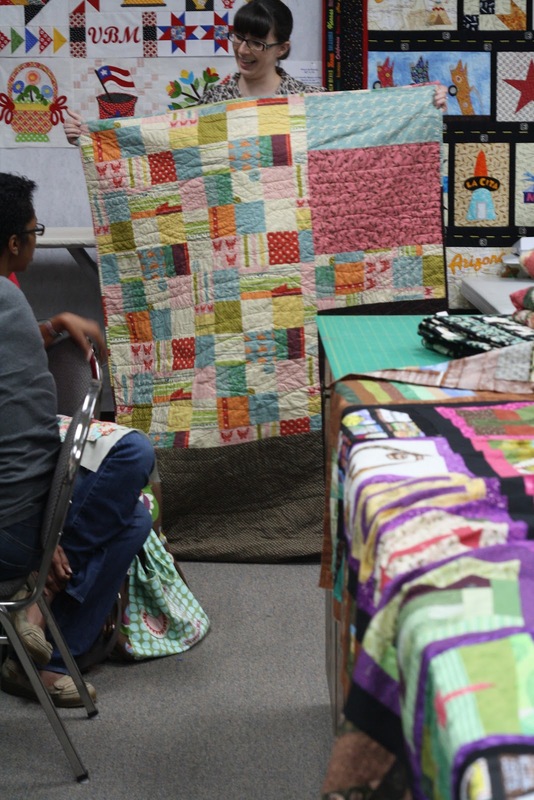 And what would your advice be to someone who is just diving into the world of quilting? Jump in! The best way to learn is to do it. You will make mistakes, but you will learn and be able to create beautiful works of art (even the simplest quilt is a work of art!) quicker than you know. 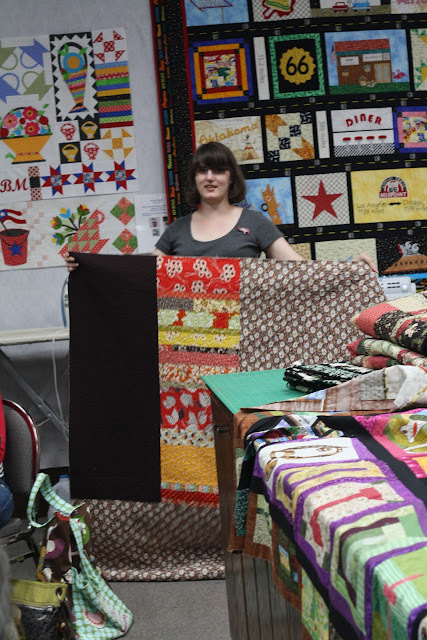 You will be more critical of your own work than most of the quilters you meet. You see the flaws, but others will see the beauty. You will too if you let yourself. Thanks, so much, Kristine! That is some great advice and I so enjoyed learning about your quilting journey!!! :) Thanks for sharing with us. Last Saturday, May 12, we finally had a meeting. Last month it was cancelled due to possible tornadoes. A few of our members were very lucky as one touched down close to their homes and places of work. EEK! We now have a standing rule that if you are in the area of a tornado you better get on Facebook and let us know you're okay!!! But, anyway, we had our meeting. We had a lot of show business to discuss, and the ball is definitely rolling. Leslie brought our flyers to hand out and some lovely posters. It's full steam ahead on this thing now. No turning back. Submissions have come and gone, and now I look forward to seeing what is chosen. :) Looks like display options are limited as well, which I think actually works in our favor. We also talked about some blog stuff...limiting ourselves to one WIP post a month, and a Finish Up Friday post will be introduced...maybe next month. We'll continue with our Coffee Talk Tuesdays...so that will be coming next week. Then of course we had some time to share our WIPs and Finished works. Here I am...HELLO!...with my first English Paper Pieced project. I am beyond proud of this thing, and I'm sure the other guild members are just flat out sick of hearing about it now. But, yeah...so fun, and it looks great hanging up on my wall. Jemellia is working on a little dresden mug rug (I think it's as mug rug...I need to start writing down what people are saying.) for a Mother's Day gift. :) Darling! Ladies in our guild really know how to make browns work for them!!! They keep them rich instead of falling flat which seems to happen so often. Crystal made these neat hexagons by fussy cutting some striped fabric. I think she has a tutorial coming up for the blog for this. YAY! I'm eager to see what the finally layout of the quilt is, and I like that she pieced the backing in hexagons as well. Kristine made this sweet cathedral window pillow for the swap we had a while back. So lovely. It has a serene feel to it. They look so perfect too, don't they?! Jealous!!! Leslie is just showing off now. I mean seriously...this woman is never lacking for ideas. A plaid houndstooth. It just rocks! Well, that's it for this meeting. 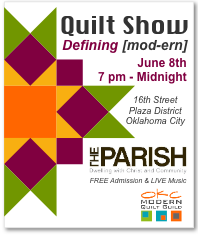 Our quilt show is on June 8. Info is on the right hand side of the blog. Hope you'll come out and see us, or our quilts rather. :) Can't wait to get some pictures of the show!!!! 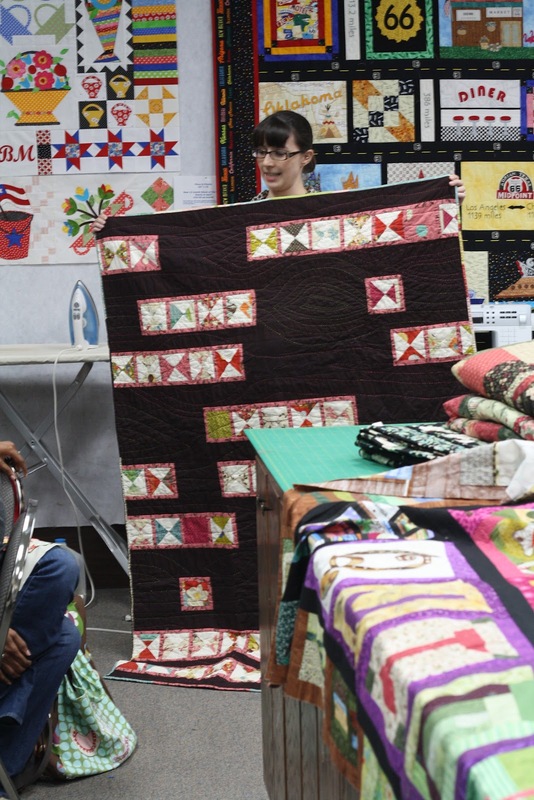 Submissions for the June Quilt Show are now open! Email up to three photos per quilt to OKCMQG@gmail.com. 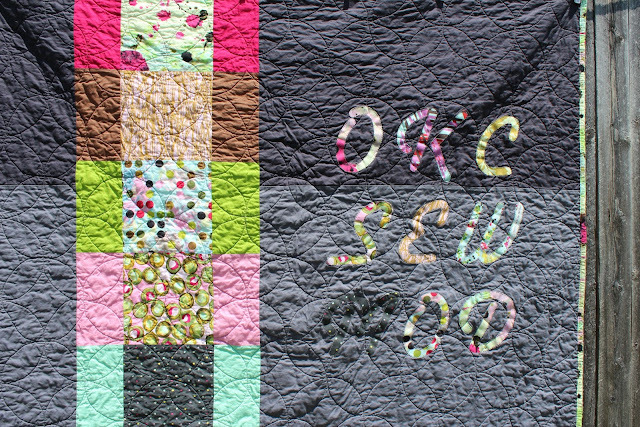 Please see a complete list of Rules on the Submission Form and on our menu bar under 2012 Quilt Show. You will be notified by June 1st as to whether or not your entry has been accepted. Get those quilts completed! You have until May 15th to submit your entry!